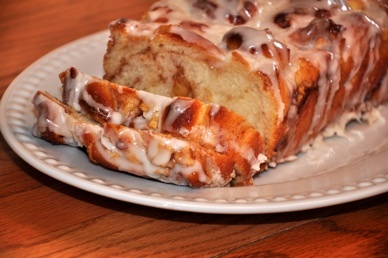 Found this online....I bought some Apple fritter bread at the store....but this looks much better. Cover with lid, and pulse till dry ingredients are well mixed. Add the 2 cups hot water and the vegetable oil. Pulse gently at lowest speed until barely combined. Scrape down sides and continue beating until smooth. Add enough additional flour until the dough cleans the sides of the mixing bowl. Add about 2 Tbs vegetable oil to the bottom of a large mixing bowl. Place dough in bowl, turning over to coat the top surface. Cover with plastic wrap and allow to rise until double. In the meantime, combine the sugar and cinnamon for the filling. Melt the butter in a large pourable container. Peel & finely dice the apple. Prepare your pans by lining with squares of parchment. This will make it so much easier to remove from the pans with all that ooey-gooey apple/sugar/caramel mixture. Turn dough onto countertop. The oil should prevent it from sticking, but add additional oil if needed. Pour a generous coating of melted butter over the dough, spreading to the edges with a spatula. Distribute diced apples evenly next. Add a healthy covering of brown sugar. Using a dough scraper, cut diagonally into 1” slices at a 45 degree angle. Now, cut diagonally the other direction, in an “X” pattern. You may wish to roughly chop it a few more times, depending on how “chunky” you like the bread. Heap the chopped dough into pans. Adjust to even out the dough. If you have any extra melted butter, you can drizzle it over each loaf - then you can even sprinkle with a little more cinnamon sugar mixture. Allow dough to rise till double. Bake at 350 degrees for about 25 - 30 minutes, being careful to check for a doughy center. If it’s still a bit doughy, give it a few more minutes. Allow to rest in pans for about 10 minutes, then remove to wire racks. Apply a generous topping of the glaze made from melted butter, powdered sugar, vanilla, and milk - stir and adjust milk/powdered sugar till a pourable consistency. Allow to cool if you want to slice it - otherwise, dig in! How did I NOT see this post??? I will be trying this!!!! Yes, you should definitely try making this Rooi! !